Quahogs and steamers were once in plentiful supply in Provincetown harbor. The above antique postcard is a 19th century color lithographic print published in Germany by F. H. Dearborn, Provincetown Massachussets. 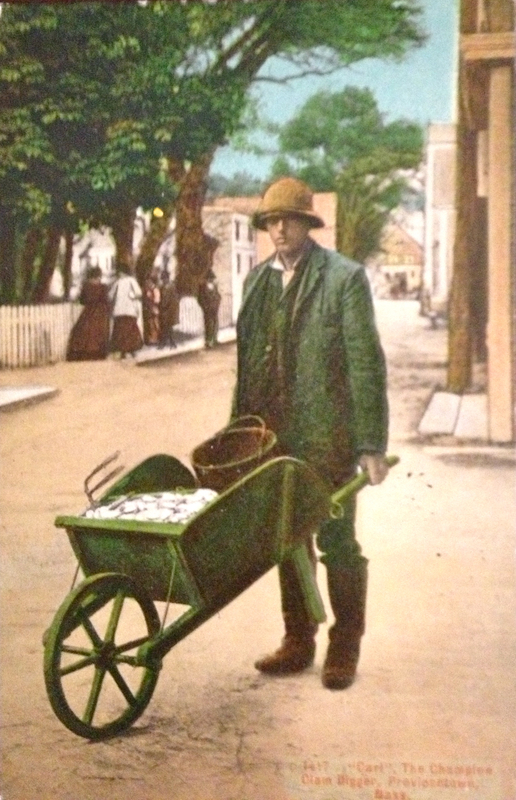 The card shows a champion clam digger, “Carl”, wheeling his haul down Commercial Street standing in front of what is now Marine Specialties. Clams were often used for fish bait. Nowadays Cape Cod clams are enjoyed fried, stuffed, steamed, and in chowders. Because the clam population has become depleted due to overfishing, clam digging is closely monitored and restricted according to season. But during the Great Depression, shellfish was an important source of protein for Cape Codders. Everyone loves a creamy hot bowl of Clam Chowder on a cold damp day. A number of Provincetown restaurants serve delicious homemade chowder and one restaurant “Sally’s Chowder Bowl,”–a fictional location, is a favorite dining spot of several of the characters in Remaining in Provincetown, the mystery novel by S.N. Cook. Who likes to eat there and why? Read the book everyone’s talking about available online and at local bookstores. Like us on Facebook and keep the conversation going.